Solution: The centre of circle is O. Solution: Three radii are OA, OB and OC. Solution: AC is diameter of circle. Solution: ED is a chord. Solution: Two points in the interior are P and O. Solution: Q is the point in the exterior of circle. Q2. 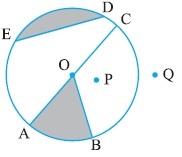 (a) Is every diameter of a circle also a chord? (b) Is every chord of a circle also a diameter? (a) Yes, every diameter of a circle is also a chord. (b) No, every chord of a circle is not a diameter. (a) Two diameters of a circle will necessarily intersect. 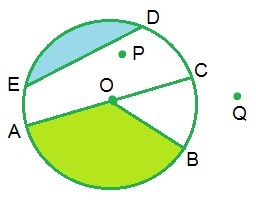 (b) The centre of a circle is always in its interior.